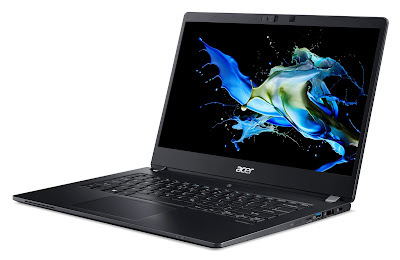 Acer has announced its latest addition to its iconic TravelMate P6 series, a thin, light, and durable commercial Windows 10 Pro notebook series built for professionals that travel frequently or work in the field. Robust and powerful with up to 20 hours1 of battery life, it’s built to withstand life on the road and support heavy workloads. Powerful, the new Windows 10 Pro notebooks are packed with up to 8th Gen Intel Core i7 processors, up to 24GB DDR4 memory, up to NVIDIA GeForce MX250 graphics, and up to 1TB of responsive Gen 3 x4 PCIe SSD using NVMe technology for speeding through editing large spreadsheets, and creating presentations. The TravelMate P614-51 makes sharing and collaborating easy with a 180-degree hinge design, enabling it to lay flat for sharing the display with others. The TravelMate P614-51’s 14-inch Full HD (1920 x 1080) IPS[iv] display delivers accurate color with 170-degree wide viewing angles. Full-sized and back-lit, the keyboard provides comfortable typing and enables travelers to work in low-light areas, such as in airplane cabins and on trains. A damage-resistant, ultra-responsive Corning® Gorilla® Glass NBT™ touchpad enables precise gesture controls and swiping. Compared to traditional mylar, Corning® Gorilla® Glass is tougher, more resistant to scratches, and easier to clean. Professionals can maintain a reliable, high-speed wireless connection with eSim-enabled[v] 4G LTE and 802.11ac 2x2 MU-MIMO technology. Intel Thunderbolt 3 delivers blazing-fast data transfers up to 40Gbs to USB Type-C-connected devices. Customers can connect a cable from the USB 3.1 Gen 2 Type-C port to a Thunderbolt 3-enabled device and get four times the data and twice the video bandwidth of any other port type while also supplying power and support for up to 8K displays. Other ports include MicroSD card and smart card readers[vi], and NFC4 (Near Field Communication) for sharing content or making mobile payments. The Acer TravelMate P614-51 will be available in North America in June, starting at USD 1,149.99, in EMEA in June, starting at EUR 1,249.00; and in China in May, starting at RMB 9,999.